Line cookie sheets with waxed paper. Gently wash strawberries; pat dry. Place frosting in 1-cup microwave-safe measuring cup. * Microwave on HIGH for 15 to 20 seconds or until melted, stirring once. 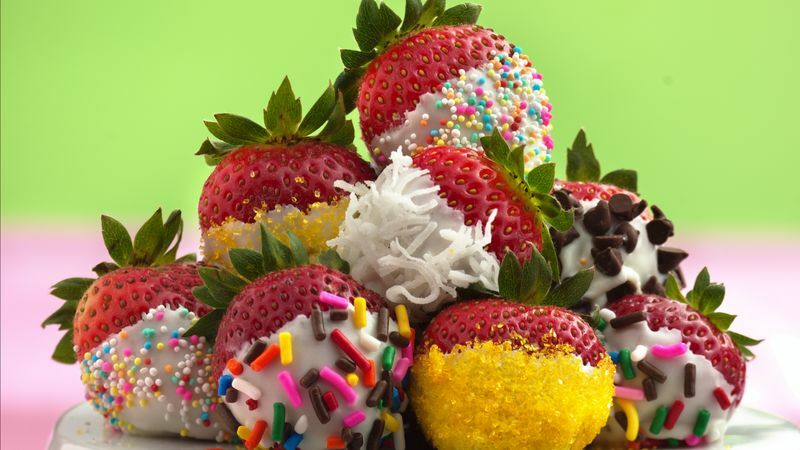 Dip strawberries in frosting, coating bottom 2/3 of each berry. Immediately dip in various topping ideas listed. Place on wax paper-lined cookie sheets. Refrigerate 5 minutes or until set. Try dipping these scrumptious strawberries in chocolate frosting instead of the vanilla frosting. * To melt frosting on stove top, place frosting in small saucepan; melt over low heat, stirring until smooth.